Night parade during Mardi Gras? Holy moly! Marching in parades can be one of the best experiences for a college band member. There is the typical community parade for an American holiday that may bring a couple thousand people, a homecoming parade around campus and then all the way up to the Rose Parade where millions of people watch across the world. Mardi Gras in New Orleans is synonymous with parades and craziness. Together they are an experience unlike anything else for a band member. From beads being thrown at you to wild decorations and extreme fans, Mardi Gras is the king of the parade circuit. 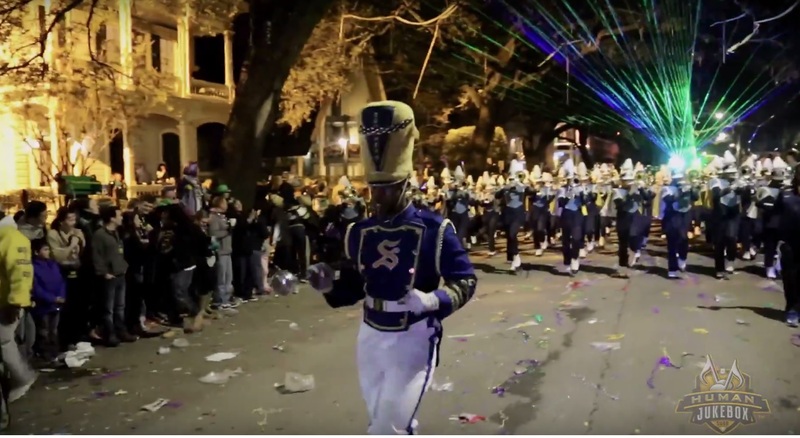 Each year many college bands march in the parades in New Orleans. One band that is a fan favorite is the Southern University Human Jukebox. Here is a look at their night time march in what is called the Krewe of Bacchus New Orleans Mardi Gras Parade. Share and enjoy!